One of the most hypocritical and stereotypical subculture wars around, Emo vs. Goth is one of my pet hates. I used to be a Goth, once upon a time, and they’re not as bad as all the Emos make out, and vice versa. One of my old friends described the difference between us as: Goth = getting laid in a coffin and Emo = listening to sad music while crying about not getting laid in a coffin. I almost cried at how demeaning and stereotypical this statement was, but it shows what some of the best Goths I know think of us. Both of our subcultures have bad stereotypes – Goths are supposedly all violent, and Emos supposedly all self-harm. We aren’t so different from each other, if you look at it in a different way. Hell, my mom thought I was emo when I was goth, and then got it wrong again when I started changing styles. And I bet that at least a few of us, I for one, love gothic rock. Sure, goths pick on us, but we don’t exactly make it any better for ourselves. Answer this: Of the gothic people at your school/in your neighbourhood, have you said something nice to at least three of them? Most of you won’t be able to say yes to that one, if the situation is as bad as it is near me. When people hurt you, they’re just trying to get a rise out of you, and by ignoring their words, you’re not giving them the satisfaction. I personally would try to be nice to the person who’s hurting me, because it’s a lot harder to hate someone who’s nice to you than one you don’t know too well. I know it’s hard, but it’s worth a try. We’re both subcultures of the same thing: punk. In fact, I’d say there’s a little of goth and a little of punk mixed together in emo. Both of us wear a lot of black and we both have amazing people in our subcultures. Let’s try looking at what is the same about Goth and Emo, instead of the differences which we dislike so much. BTW, my birthday is NEXT week, I fucked that up lol. No, I fucked that up by posting the wrong article. >.< Sorry. Yeah I should. My memory is horrible. I literally had to go back and do research on the forum to find out when I’m supposed to schedule random emo kid’s posts. Hope Tuesday was the day . . . cause yeah, that’s when they’re posting. XD See, it’s really that bad. It’s amazing I even survive. im mixed between emo and goth. i go back and forth depending on my mood. i think people really should stop hating on eachother. 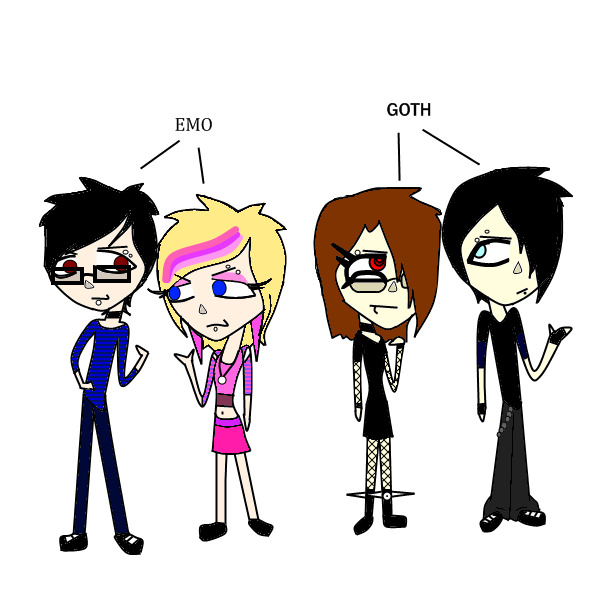 goth and emo are too similer and have too much of a bad rap to hate eachother. we gotta stick together! I know! I mean, I still hang around with my goth friends, and they’re starting to accept that I’m still the same person, I just look a little different than I usec to. There are still goths around? Wow. That’s amazing. I barely ever see them. I think I saw one or two goths at my school a couple of times. Though there aren’t as many around where I live anymore. All I see now are scene kids, and sometimes emo kids, which isn’t bad. I think you’re definitely right; we’re all outcasts so let’s stick together! Besides, I’m torn between Goth and Emo because I love The Cure, Bauhaus, Edgar Allan Poe, lacey tops/dresses, boots, checkered skirts and I also love Escape The Fate, Sunny Day Real Estate (bands), emo hair, skinny jeans, converse, band T-shirts and rubber bracelets. So I am proudly declaring my style as GOTHMO! is pure emo music like breaking benjamin, 3dg, afi, and him?